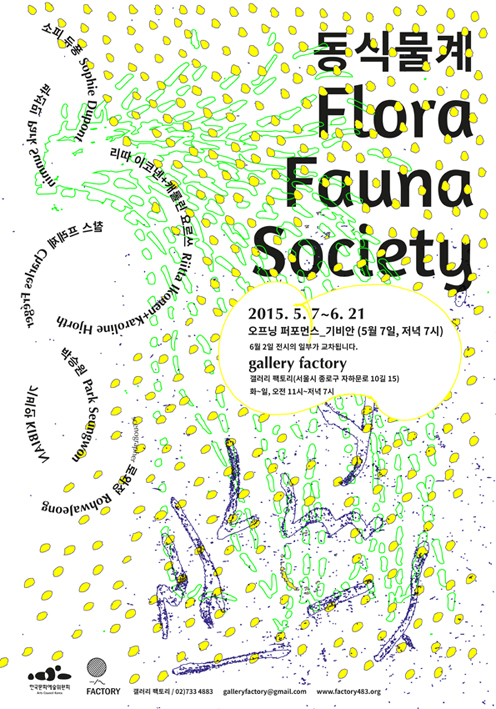 FloraFauna Society opens tonight in Gallery Factory, Seoul, Korea! Park Seungwon expresses the relation between the existence of animals and human, between human and the ecosystem in a concrete frame through corporal expression in Siara M, Well roared Lion!, Homo Artex and Homo Magicus. Park Sunmin’s Shortsighted Jungle portrays the gap between darkness and light, growth and extinction. Sophie Dupont’s Marking Breath breaks barriers between artistic act and act of living through the repetitious meditative work of marking each ‘breath’ from sunset to dawn. Charles Fréger Wilder Mann series and Riitta Ikonen & Karoline Hjorth’s Eyes as Big as Plates series portray the animal-like, plant-like images of human beings as part of natural ecosystem. Performances and object works One-Actxxxxxx of KIBIAN (aka Ahn Kanghyun) maintain the process and attitude of organic movement in continuous addition. The exhibition does not begin with a complete form. The works appear in the venue and disappear, intersect each other and change. Along with the exhibition, a mixture of performance, video screening, booklets, etc. allows endless new relations among them. Rohwajeong participates as exhibition designer, creating the ecological tone of the exhibition while rendering the space with profoundness. FloraFauna Society opens with KIBIAN’s performance tonight at 7pm and a part of the exhibition will be intersected on the 2nd of June. The exhibition is up until 21 June, 2015. Welcome! Press release for more info.